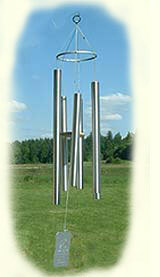 What makes our Wind Chimes exceptional? The quality and talent of the people who make them. Read more below about Grace Note Wind Chimes, the special suspension design, precision tuning, care guide, and 10-year warranty. Enjoy the wind as it plays charming melodies for you on hand-tuned wind chimes by Grace Note Wind Chimes. Because the seven distinctive tunings are all relative to the key of C-Major, the chimes will even harmonize with each other when hung in pairs or sets. Each tuning has a name reflective of a setting or mood that might come to mind as the wind plays according to its own desires. The names are: Earthsong, Treasure of Heaven, Summer Daydream, Island Melody, Stardust, Sunrise Serenade, and Himalayan Echo. As you browse through this section we think you will agree that Will of the Wind carries the most consistently beautiful sounding wind chimes you will ever find. * The sample you hear playing in the background when the web page opens is the Himalayan Echo Deluxe Wind Carillon. From the smallest Petite Classic Wind Chimes to the glorious Wind Carillons, all are exceptionally resonant and pleasant so you will never tire of hearing them. In addition, the wind rarely if ever plays the same song twice, so the tunes are ever changing. All wind chimes are guaranteed for 10 years from the time of purchase and usually last much longer. Designed for ultimate clarity of tone and resonance, these Grace Note, tuned wind chimes, feature a unique pinned suspension device combined with superior materials and craftsmanship. Grace Note chimes incorporates the use of a pin inside the tubes at the resonate node. The resonate node is the spot on the tube that doesn’t vibrate. The pin eliminates the interference of the string against the tubes. This innovative design provides a longer and clearer resonance. All tunings are in the key of C, with corresponding notes and chord engraved on one side of the aluminum wind plate. The wind chimes are handcrafted from thick tempered aluminum tubing with a soft-brushed finish. Chimes now feature a recycled composite lumber striker. Composite lumber is not only environmentally friendly it creates a softer contact sound when applied to wind chime tubing. The chimes are intended for outdoor use and will provide years of enjoyment with little or no maintenance. In corrosive environments, like coastal areas, the chimes will maintain a high luster if treated semi-annually with a protective lubricant such as gun oil or silicon spray. If cleaning is desired, we suggest a nonmetallic scouring pad. Do not use steel wool. The "environmentally friendly" composite-lumbar strikers are not subject to drying or cracking and require no maintenance. All chimes are guaranteed by Grace Note Chimes for 10 years under normal use. Hand made in the U.S.A.